SHERRY is a fortified wine made from white grapes that are grown near the town of Jerez de la Frontera in Andalusia, Spain. Sherry is produced in a variety of dry styles made primarily from the Palomino grape, ranging from light versions similar to white table wines, such as Manzanilla and Fino, to darker and heavier versions that have been allowed to oxidise as they age in barrel, such as Amontillado and Oloroso. Sweet dessert wines are also made, from Pedro Ximenez or Moscatel grapes, and are sometimes blended with Palomino-based Sherries. After fermentation is complete, the base wines are fortified with grape spirit in order to increase their final alcohol content. Wines classified as suitable for aging as Fino and Manzanilla are fortified until they reach a total alcohol content of 15.5 per cent by volume. As they age in barrel, they develop a layer of flor—a yeast-like growth that helps protect the wine from excessive oxidation. Those wines that are classified to undergo aging as Oloroso are fortified to reach an alcohol content of at least 17 per cent. They do not develop flor and so oxidise slightly as they age, giving them a darker colour. Because the fortification takes place after fermentation, most Sherries are initially dry, with any sweetness being added later. In contrast, Port wine, for example, is fortified halfway through its fermentation, which stops the process so that not all of the sugar is turned into alcohol. Wines from different years are aged and blended using a solera system before bottling, so that bottles of Sherry will not usually carry a specific vintage year and can contain a small proportion of very old wine. 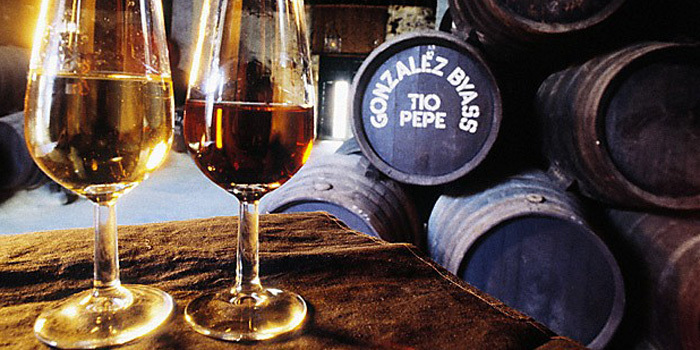 Sherry is regarded by many wine writers as "underappreciated" and a "neglected wine treasure". Fortified wine - wine to which a distilled spirit, usually brandy, is added. Many different styles of fortified wine have been developed, including Port, Sherry, Madeira, Marsala, Commandaria wine, and the aromatised wine Vermouth. JEREZ - XÉRÈS - SHERRY - the official Sherry site. Sales of dry sherry soar as hipster generation drives revival - The Guardian. Whisky & sherry, an unlikely perfect marriage? - The Telegraph. BODEGAS ARGÜESO - founded 1822. HARVEYS BRISTOL CREAM - since 1796. LA BOTA DE OLOROSO VIEJÍSIMO (n° 14) - limited release: 600 bottles. LA GITANA - founded 1792. LA INA - considered by many critics to be one of the benchmark Spanish Finos. TÍO PEPE - founded 1844. The best selling brand in the world.